Here’s the short of it. Both don’t leave a white cast and apply like lotion. Pratima’s is less expensive ($32), while JR’s is about twice the price ($55/85 ish). Pratima’s has a shorter list of ingredients, while JR’s is chocked full of herbs. Pratima’s is a harder to get ahold of plus pricey shipping, whereas JR is available at most green beauty shops. I haven’t gotten burned while wearing either sunscreen. While I have repurchased both sunscreens multiple times, recently I have repurchased NDC more due to convenience. When you are out of sunscreen and the sun is blazing down in California, two-day shipping from a shop like Integrity Botanicals is a life saver. The beautiful ingredients don’t hurt either. Some things I like about the ingredients list right off the bat: where’s the aqua? Glad I’m not paying to have water at the top of the list. Sun protection comes via the physical sun blocker zinc oxide. There is an absolute load of herbs in the herbal infusion, which is awesome, though it initially intimidated me since it would be hard to isolate a cause of breakout with such a long list. Luckily, no breakouts for me. And I sampled the product twice to make sure before taking the full-size plunge. While skin is personal and what doesn’t break me out may break you out, I do know my friend Marcella from Naturally Marcy who is also acne-prone took a break from sunscreen out of fear of breaking out until she started using the Nutrient Day Cream. I think what NDC has going for it is the combination of healing and soothing ingredients which is super friendly to acne-prone skin. I would summarize the ingredients as so: zinc oxide, aloe, butters/waxes, ~12 oils, ~25 herbs (that’s twice as many herbs than oils), and potassium sorbate as the preservative. It may be a sunscreen, but there’s no shortage of moisturizing ingredients, which I am a huge fan of. The oils are pretty diverse, ranging from oils I typically use in cooking (sesame, avocado, olive–though I’m sure the quality is completely on a different scale), oils that typically are the majority oil in face oil products (jojoba, hemp, almond, grape seed), and oils I think are really special, like the wound-healing sea buckthorn or the silicone-imitating broccoli oil. It was honestly kind of difficult trying to find research that backs up every claim noted in the benefits section, so I reached out to Josh Rosebrook himself for some help. From Josh: “anti inflammatories are powerful plant constituents which support and accelerate the skin’s natural healing function.” Many of the ingredients listed are noted to treat acne, namely hemp, sea buckthorn, nettles, linden, and chamomile. Studies show that acne is an inflammatory disease, and that anti-inflammatory drugs can treat acne by treating inflammation (source). In addition, by treating inflammation, you also treat redness (hey there, borage and sage). By removing redness, you’re inherently brightening your skin (not necessarily whitening, however)–looking at you, hemp, rose hips, nettles, bilberry, dandelion, and burdock. The reason why hemp seed oil in particular is anti-inflammatory is thanks to its balance of omega-6 and omega-3 fatty acids (study). For chamomile, it’s due to “an essential blue oil” containing anti-inflammatory things–“chamazulene” ring a bell, anyone (study)? Even though Nutrient Day Cream has the feel/benefits of a moisturizer and could function as a day moisturizer plus SPF, I still go through my usual moisturizing routine (combo of toner/serums/oils/creams sans SPF) in the morning before applying NDC. It’s not that Nutrient Day Cream is not moisturizing, because it is. I’m always left with a nice moisturized-but-not-oily look. I personally prefer to separate my moisturizing cocktails from my SPF in general, and joyfully with this SPF, my face never feels overly moisturized. In fact, especially when paired with an oil underneath like MV Skincare’s Rose Plus Booster, cream foundations from rms or Kjaer Weis as well as liquid foundations like Gressa glide on wonderfully smoothly over the NDC. As per instructions, I always apply the sunscreen after a facial mist after my normal moisturizing routine. This makes the product easier to apply, more easily absorbed, etc., not that it is terribly thick. As not per the instructions, I typically use one pump at most on my face and neck as opposed to the recommended two pumps. I do a mixture of spreading and patting (a girl is usually in a hurry, ok? ), though Josh Rosebrook recommends patting only (Instagram demo). Since I usually wear makeup over my sunscreen, I don’t re-apply every two hours, because let’s be real. Am I going to apply a liquid sunscreen over my foundation midday? Am I going to wash off my face midday, reapply sunscreen, and reapply my makeup midday? I do try to also practice other forms of safe sun like shade and hats. Which isn’t hard when you’re coding inside all day. If I’m not wearing makeup and I’m headed to the beach (rare), I would re-apply. As briefly mentioned before, similarly to Pratima’s sunscreen, NDC leaves no white cast. Several years ago, I think it was begrudgingly okay for a #greenbeauty sunscreen to leave somewhat of a white cast–that was the cross we had to bear for shunning conventional dimethicones and whatnot, right? 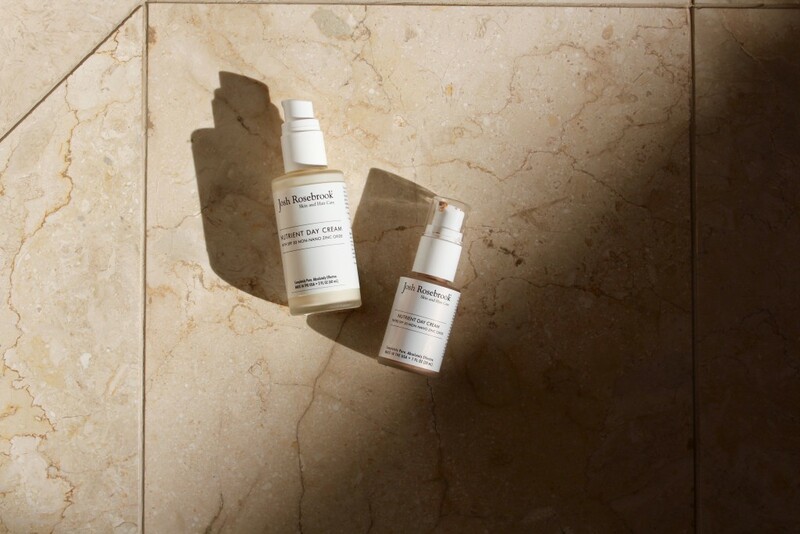 But nowadays, brands, like Josh Rosebrook, have shown it is not only possible to formulate sunscreen without that tacky white film leftover by zinc oxide, but also to make sunscreen as nice, easy, and beneficial as moisturizers without compromising ingredients. The tinted Nutrient Day Cream is virtually the same as the untinted except for price–it’s $5-10 pricier depending on the size–and the inclusion of mica. The tint is subtle. Extremely subtle. If you are worried that the tint doesn’t match your skintone, don’t worry. My reddish acne scars and redness in general definitely peek out under the tint, and personally I would consider myself still “makeup-free” when I walk out the door with this as my last layer. However, I do confirm that this brightens my skin and is a fabulous primer underneath makeup (no pilling! ), though I wouldn’t say that the untinted version performs much less in those areas. I probably personally will stick with the untinted version going forwards (since starting to write this post, I have gone through at least one or two more bottles of the untinted version in fact). My redness needs more than a slight tint for coverage, but if you have basically perfect skin, the tint is for you. As far as the scent goes, I believe that Josh Rosebrook has this gift for marshmallows (if you have the Hydrating Accelerator, you know what I mean). The Nutrient Day Cream is no exception. I’ve read descriptions of the tinted version smelling like chocolate cookies, and I would +1 that. Another small difference I believe is in the texture: the untinted is slightly runnier whereas the tinted is a little “plusher” in feeling, if that makes sense. The pump packaging, while I love it for aesthetic and hygiene, drives me absolutely nuts when I hit the point in the product where I know/see/have product left, but I can’t pump it out. I’ll be unable to pump out product and think I have none left, and yet I find myself being able to scrape out product for a month or two after by unscrewing the cap and taking off product from the applicator manually. I imagine it could be a pricy upgrade on an already somewhat pricy product, but some form of airless pump which can get all the product out would be stellar. Some sidenotes. Something I really love to see is when other brand owners love products from other brands, and NDC is really well-loved across multiple brands. A lot of brands get a lot of requests for making sunscreens, and it’s notoriously hard to formulate in terms of trying to balance non-greasiness with protection, and many of the times, they’ll point people to this one. Just saying. tl;dr Sunscreen with no white cast that feels/functions like a moisturizer thanks to ingredients, many of which are anti-inflammatory, thus being very acne-friendly. Have you tried the Nutrient Day Cream? If so, what are your thoughts? Else, what’s your go-to sunscreen? 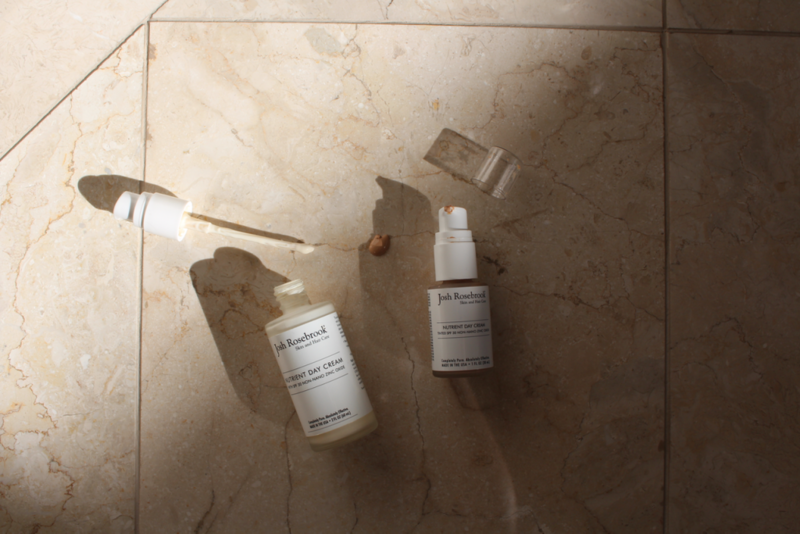 Disclaimer: I initially received samples from Josh Rosebrook of the Nutrient Day Cream shortly after its launch and then proceeded to purchase the product myself from various retailers multiple times. All thoughts and opinions are my own. While this is a sponsored post for Follain, I actually started writing this post nearly two years ago, and have purchased the mentioned products many, many times. Hi nice review. I noticed that this cream has only 12% zinc but SPF is 30 – whereas most other brands (Marie Veronique, kypris, de Mamiel etc. etc) use at least 20% zinc for an spf 30, so not sure if this is really giving a 30 protection?! I think it also says cream with spf 30 zinc – rather than spf 30. Thanks Mara! Check out this blog post by Josh Rosebrook that addresses your concerns: https://joshrosebrook.com/blogs/news/the-best-sunscreen-zinc-oxide-and-the-nutrient-day-cream-spf30 In short, in testing the Nutrient Day Cream actually averages SPF 37 in lab tests. I thought Josh Rosebrook was ok (I tried both tinted and untinted). It smelled fab and looked nice on my skin, but it also made me oily. I prefer Pratima. It always made me less oily and I liked how it hydrated my skin. I used to use the Neem Vetiver body version SPF on my face because it was way more economical, but it looks like they no longer make it, so I guess I’ll have to shell out for the rose (I wish their shipping wasn’t so $$$!). I’m currently using up some Dr. Dennis Gross Mineral Sun Spray, which has an awesome texture and some nice antioxidants, but I’m not sure it protects me as well as Pratima does, and I suspect the silicones may be breaking me out a little, though it’s hard to tell. Pratima always seemed to improve and heal my skin. Ah, yes I would agree that Pratima leaves a more matte finish. I’m sad Pratima doesn’t make the body sunscreen anymore–I think Lilly from Genuine Glow also used it on her face as well without irritation. 🙁 about the potential breakouts from the sunscreen–hopefully they will pass soon!